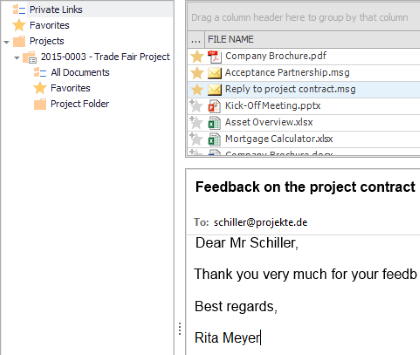 With InLoox you can sort project-independent documents into folders – directly in InLoox. You can also add personal documents and manage them together with your project and department documents all in one place. You don’t even need to open a specific project. The project-independent document section offers the same features as the document section in the different projects. For more information on the features in the document section please see the Organize project-related documents chapter. 1. Click on Documents in the InLoox PM or InLoox now tab. 2. The Documents area opens. Here you´ll find a folder tree structure on the left. There, click on Private Links. You can store all your personal and project-independent documents in the Private Links folder. Additionally, the tree structure allows you to access all documents of your projects. Therefor click on the project folder in the tree structure. 3. Now click on New Private Link in the Start tab, to create a new link to a personal document. 4. Now select the regarding document from your computer or your file server. The document is now linked to InLoox PM without having to have a relation to an InLoox project. Other InLoox users cannot access the document. If you use InLoox for Outlook in combination with InLoox now! you can also upload documents. Just follow the same steps as if you were to create a personal link in InLoox PM. 5. If you want to assign the document to a project later on, please select a document from the document list and click on Assign Project on the Start tab. Organize personal and project-independent documents • Copyright 1999-2019 © InLoox, Inc. All rights reserved.